Julie Ann Crawford Lamons was born on March 25, 1953 in Newport Arkansas USA. She graduated from Bradford HS in 1971.Her interest in art began in her teens after drawing members of her church. She set aside her love of art for a few years after the birth of her twin daughters. Several years later she picked up her paintbrushes and began again a journey to bring her art to life in the world around her. Julie graduated from a two-year art program with Penn Foster Schools in 2005, and is participated in workshops and working with the local artists. She enjoys working with acrylic and oil. She has a studio and small gallery located in Pleasant Plains, Arkansas. You will see a wide variety in her gallery from inspirational to landscape and still life. In 2006 Julie was a member of the gallery walk committee of Heber Springs, Arkansas which worked to promote the arts in the area. She has been featured in Local Newspapers, and The Arkansas Newspaper magazine Three Rivers Edition. 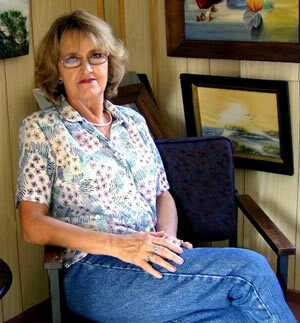 She is a member of the Arkansas Artist Registry and The Eureka Springs Artist Registry. One of her paintings, Hay Bales was exhibited at the Clinton Presidential Library (July–August 2007, sponsored by the Clinton Foundation and the Thea Foundation), from where it moved to the El Dorado High School for the school year 2007/8 with Art Across Arkansas. She continues today to work with her local community to bring her love of art to others. 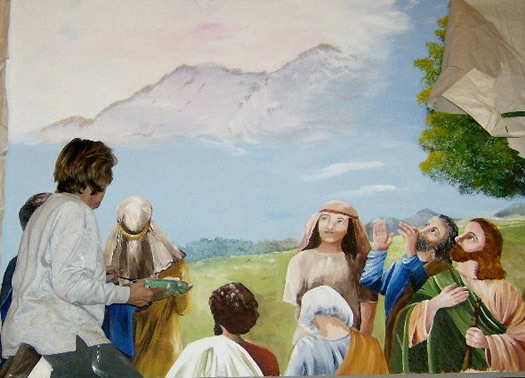 I was asked by the pastor of a local church if I would be interested in painting a mural. Despite some doubts (not least of which was the practicalities of working on scaffolding up to ceiling height), I said yes and before I knew it I was presenting a slide show of ideas at a church meeting. My brief from this first meeting was to present three scenes in one: the cross, the tomb, and the ascension of Christ. I began evaluating the mural space – a 9×23 feet rectangle with a peak at the center — to find the appropriate style and approach to fulfill the church’s needs. I sketched out my composition onto two sheets of paper I’d stuck together. (Later I gridded it up into inch squares to help me transfer the design to the wall.) I wanted to put some landscape (trees or shrubs) between each scene to make it look more natural. I did some research on the Internet to see what the landscape in the area in Israel actually looks like, then mixed in a little artistic license. 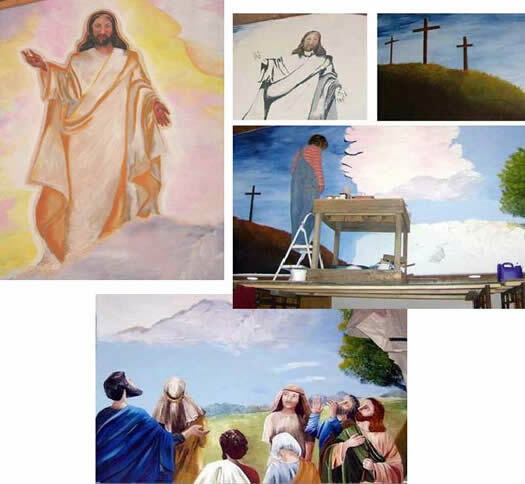 In order to place the emphasis of the mural the ascension, I deliberately placed dark clouds over the crosses, used medium tones over the tomb, and light tones over the ascension. The crowd looking up initially looked a little unnatural to me and I needed to make the figures feel as if they belonged. 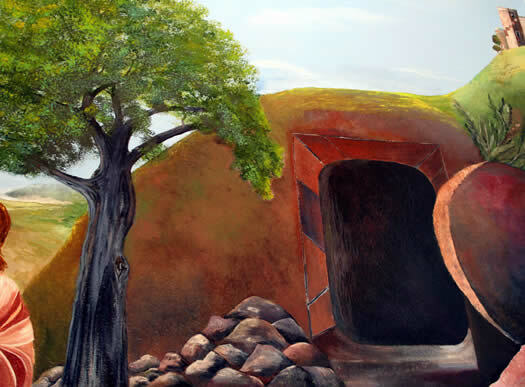 I feel I achieved this in the final mural through the placement of the tree and the landscape receding behind them. The pencil sketch of my final composition for the mural. © Mural sketch by Julie Lamons. Getting the composition figured out took me a few days. When I presented my final sketch to the church I still felt I hadn’t gotten all the bugs out, but felt confident I would. Some people felt the mural should progress from the cross, to the tomb, to the ascension, but with that peak in the center of the space I kept coming back to the ascension in the center. Another artist I showed my composition to suggested I got rid of the steps in front of the tomb as the rock wouldn’t roll into place to close it the way I had the steps. A good suggestion indeed! The church liked and approved my sketch, and the debate then moved onto which colors should be used. 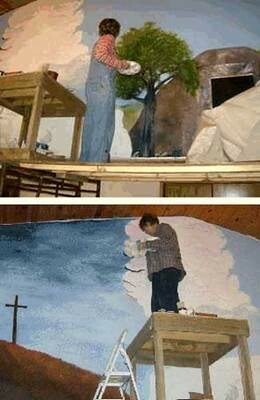 The mural would be the first thing you see entering the church. Some people wanted muted color, some wanted warm colors, some wanted bright. My preference was for warm or earthy colors. A grid was used to transfer my sketch to the wall. © Julie Lamons. Scaffolds were put up so I could get to the wall where the mural would be, then my husband put down a “floor” with a border on it so I wouldn’t forget where I was while painting and slip. I had looked at the condition of the surface to be painted and the environmental exposure the mural would have in order to select the right type of paint. The church said they wanted me to use quality paint, not house paint , as they wanted the mural to last. I decided I would need to prime the wall first before painting as it needed to be free of any grease, wax, or oil as well as structurally sound and free of loose particles. Although it looked very clean, I washed the wall before priming it using Liquitex Acrylic Gesso, which dries white. When it had dried, I sanded it smooth. 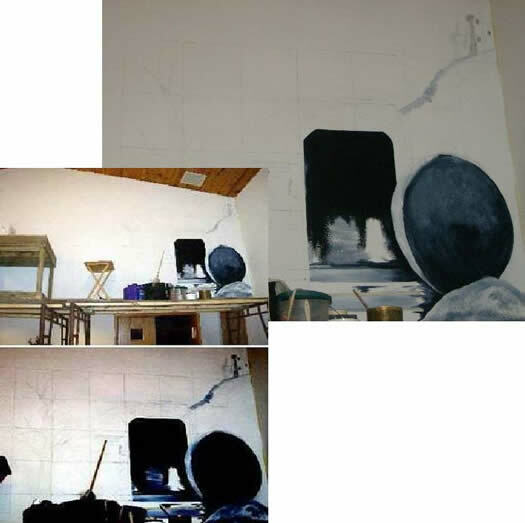 That took me two days but I wanted the surface on which I painted the mural to be decently prepared. I used artist’s quality acrylic paint for the mural, mostly Golden Artist Colors. When the paints I’d ordered to do the mural arrived, a large box of over 40 Golden paints, it felt like Christmas! © Mural by Julie Lamons. Photos by Portrait Designs of Cave City, Ar. I started painting the mural at the tomb, but ran out of Payne’s gray and had to wait, frustrated, for my paint order to arrive. My sister Judy came to help me paint and we had some “debate” over a few things, including the sky color which I wasn’t satisfied with. But in the end we were both on the same page and worked well together. I initially painted the tomb opening too large for the stone (Judy brought that to my attention!) and reduced it down to fit the stone, which made it look better. But I wasn’t happy with my initial painting of the olive tree and reworked it a few times. When I was painting I had to frequently back up to check out the proportions, color and the composition. This is very important in painting a large space, and the mural being high up makes it even more important because from looking at eye level something would seem fine, but when I got off the scaffolds it wouldn’t. The colors were also exaggerated to make them visible down on floor level. I found myself getting anxious to finish as people kept wanting to have a peak but I didn’t want anyone to see until it was finished (or rather any comments on the work in progress). When I’d finished painting for the day, I covered the mural with a cloth. 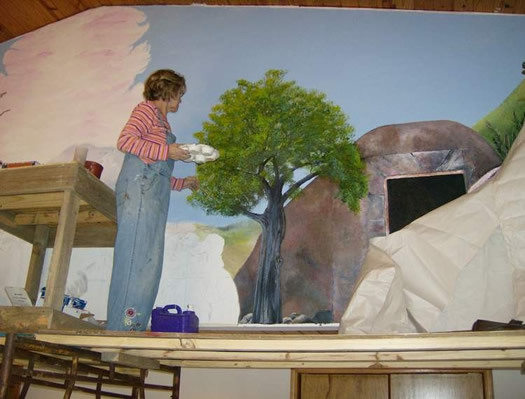 The final few days I painted alone as Judy had another commitment, but I promised to wait on varnishing the mural until she returned and we’d done a final critique of it together. I discovered in painting a mural on location there is vast difference to painting in the comfort of your own studio on easel. In my studio I’ve always got supplies readily available, and my workspace is private. I’ve got all sizes and types of brushes, and generally use only small tubes of paint (2 oz). Painting on location you’ve no privacy and you’ve got to transport all your supplies. I bought larger quantities of paint (4 oz. and 16 oz. ), and several larger brushes (three- and four-inch). In the event, I found I wasn’t used to working with so large a brush and went back to using my one- and two-inch brushes. To paint the sky I used Judy’s formula of cobalt blue, a touch of yellow ocher, and titanium white , which we mixed in a large quantity. For the dark clouds over the crosses I used ultramarine blue andPaynes gray . 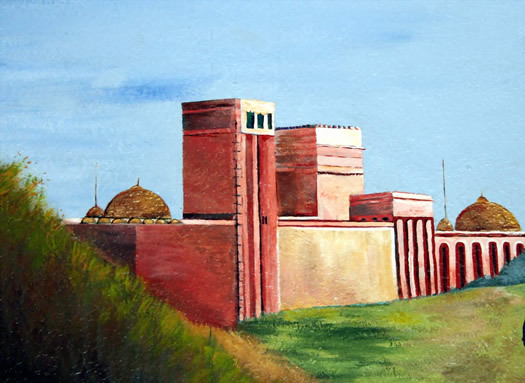 To paint the tomb I worked wet-on-wet as I wanted the colors to entwine each other creating the appearance I desired, which couldn’t be achieved working on dry paint. I used red oxide, ultramarine blue, Payne’s gray, and burnt sienna. Titanium white was used to mix with these colors to create the lighter shade reflecting the sun. The colors used for the garments included: yellow ocher, burnt sienna, raw sienna, crimson, cadmium red and yellow, Payne’s gray, emerald and oxide green, and cerulean, cobalt, phthalo, and ultramarine blue. the left (Judy says it is because I am left handed). I was careful to make sure this was done accurately. Working with acrylic we had to be concerned with the fast drying time, since directly above the mural were two vents. There were times when we had to turn the heat off to complete the sky without it drying too quickly. After I thought the project was finished and the scaffolds removed, someone asked me if the figure in the center was a girl… It was meant to be a man, so back up I went to add a beard onto him (and make a few other corrections while I was at it). Signing the mural was a task of its own. I knew my signature would be seen, so how did I sign it? Would I use my full name or would I sign it the same as a canvas, with my first initial and last name. In order to protect the mural from pollution and dust in the environment, I varnished it a few days later with artist’s quality varnish (also from Golden). The finished mural. 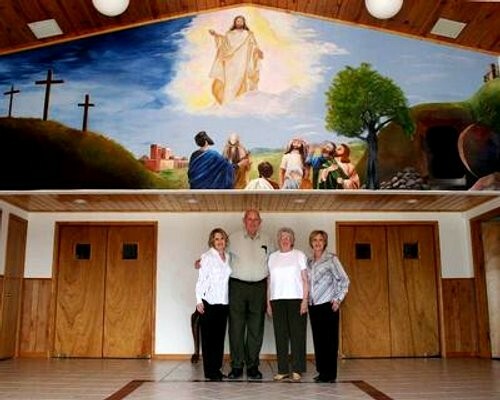 Left to right: Julie Lamons, (pastor) Kenneth and Freda Altom, and Judy Gagner.© Easter Mural by Julie Lamons. Photos by Portrait Designs of Cave City, Ar. The final mural, titled The Redemption, was finished just in time for . At 9×23 feet (6.5 feet at the sides) it’s the biggest mural I’ve ever done. Every day that I went to paint on the mural I said a prayer before starting. Except for one particular day, when I was running late and I forgot to take the few minutes to pray. What could go wrong did; I ended up hurting Judy’s feelings, she hurt my feelings, and together we made mud. It didn’t take long for us to figure out that the day was in ruins because of our neglecting to pray. I never forgot to pray again, and was blessed for doing so. I am a person with strong spiritual convictions and I do believe the Lord was guiding me. I feel like the Lord showed me that I could paint if I trusted him to help me. I got very dizzy at first on those scaffolds, but when I got my mind on working I got over it. This has been a true test for me, both physically and mentally, but I believe it was meant to be. I had to do it, I did do it, and I’m delighted with it. Great work! I have seen this in person, and it really is amazing! I think her brother Gene Crawford was my real inspiration. His fond treatment of Julie as a child that established creativity in the artistic work of both Julie or Judy. This was beautiful! Great job Julie! I always say, God has a plan! Thank you so much for sharing your Mural painting! I often wonder if someday I wll be tempted to do a Mural or large painting. Julie, as I read the article and looked at the pictures of the mural you painted I came to the conclusion that your work is as truelly beautiful as you are. Great, fantastic awesome job! I had a little laugh of shared experience here and there reading your description – I haven’t painted a mural but know the challenges of working outside your own studio haven and of the things that happen on days when you forget to give thanks! Lovely account of your work and a beautiful piece – to me, it’s at once inspiring and familiar – the figures, I guess your style, make the figures look so approachable. I’m sure it will provide many a person inspiration on many days to come. I loved it, you are a terrific artist. I must disagree with “Gene”. The elder sibling’s praise and guidance surely left a lasting impression that catpulted the Twin’s to artistic success. The Mural will bring solace to all who see it! Julie and Judy have found something that brings them joy and satisfaction. The result of their labor is providing much more to others than even they realize. I love the fact that you took on a challenge that big. I never did a “big” mural but I took on smaller projects and it was such a learning experience. God was really working with you. Thanks for demonstrating, it really helps to know someone else has challenges that can be overcome, especially if they know they have spiritual help all the way. I think when God called you as an artist you just enjoy what you are doing, I recently started painting too,I always liked painting but now I like it even more and it’s an incredible journey in discovery. what a beautiful Lord we serve! as for you my sister , keep up what you are doing. your message is clear! nothing is impossible for those who believe! I would like to do those kind of projects in the future. I know you would be glad to help. Thank you so much for sharing this huge project with us. I was asked by a friend to paint her a mural and have been afraid to undertake such a large task. You have given me courage to take on the challenge. I too will remember to start each day in prayer as I know I can do nothing without God. Really nice work! I enjoyed all the pictures, especially of Julie doing the painting. It helps to appreciate the large scale of the mural. It is huge!! We have worked with several churches who wanted photo mural installations. It’s nice to see such beautiful modern art in churches. Bravo Julia, what a magnificent project.